Well the time is here, kids off of school for summer break ! 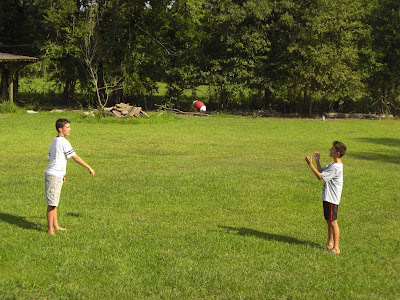 My boys love to be outside and I am always looking for great "toys" they can use outdoors. Nerf sent my 10yr old & 13 yr old the Nerf NFL Pro Grip Football. Right away they opened it up and headed out the door to play. They played until I made them them come in because of the summer heat. They seem to want to go outside daily to toss around the football , as a mom I prefer them doing that instead of wanting to sit in front of the TV . They even take it with us when we go somewhere that they know they can play, such as grandma's house or the park. I think it is great you can buy them with your favorite NFL teams. 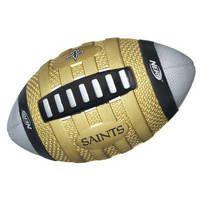 As you can see in the photo I like the New Orleans Saints.... Hey you can not live here and not like them. They have many teams available such as Dallas Cowboys, New York Giants, Indianapolis Colts just to name a few. This you make a great gift for any sports lover of any age. I know both my 2 older boys gave it 2 thumbs up ! Team up with NERF and the NFL! This licensed football is emblazoned with one of your favorite NFL teams' emblems and colors so you can get your game on just like the pros. The special PRO GRIP texture is specially designed for better throwing and catching, helping you and your team march down the field to victory. A NERF NFL PRO GRIP Football !!! The "NERF NERFOOP (Retro Edition)" basketball & backboard bring back memories of college dorm life...I need one for my office !!! The PLAYSKOOL BUSY BASICS BUSY BALL CHOO CHOO caught my eye! My kids would love the PLAY-DOH CREATIVITY CENTER! The EASY-BAKE Oven and Snack Center is a classic. Thanks for the chance. Tristan would like the TONKA BOUNCE BACK RACER. oh, i love the easy bake oven!! What kid can't use a football?! The PLAYSKOOL GAMES GATOR GOLF looks like fun too. http://www.hasbrotoyshop.com/ProductsByCategory.htm?CD=11&ST=SO&ID=23818&PG=3 Thats the one DJ likes! I also like the furreal friends elephant. PLAYSKOOL CLIPO CREATIVITY TABLE looks great too! NERF ACTION BLASTERS BIG BAD BOW man would my son have fun with this one! I'd love to have the TRANSFORMERS Movie 2:REVENGE OF THE FALLEN- Legends Figure Case Pack for my son as well. The Nerf N-Strike Vulcan EBF-25 looks awesome! I like the PLAY-DOH CREATIVITY CENTER because it would keep the kids busy for hours. I still like the good ole Lite-Brites. My son would like the Tonka Bounce Back Racer. Thanks for the chance. My kids would like the Monopoly Star Wars Clone Wars Edition game too. Thanks! With summer here the SUPER SOAKER AQUASHOCK ARCTIC BLAST would be perfect. The EASY-BAKE Oven and Snack Center catches my eye! I like the Playskool Games Gator Golf! They have the new Clue on the website, I played it at my brothers house and it was awesome! I like the Nerf Action Blaster Big Bad Bow. Count me in for 07/04/09 :) Happy 4th !! The Nerf Dart Tag Hyperfire Deluxe 2-Player Set sounds like it would be a lot of fun! Both sets of my grandchildren have a Wii so I liked some of the games for the wii such as Monopoly and the Nerf and strik with switch shot EX3 Blaster. My son would love the TRANSFORMERS Movie 2:REVENGE OF THE FALLEN- Legends Figure Case Pack! He would also really love this Football! I also subscribe via e-mail! My son would love the TONKA BOUNCE BACK RACER. The GI Joe mighty mugs is just soooo cute. My little guy is just now getting into sports and army so both this giveaway and the GI Joe items on the site really got my attention. Almost birthday time! I'm diggin' the Baby Alive Sip n' Slurp. My son would love the NERF N-STRIKE VULCAN EBF-25 YELLOW! I like the PlayDo Playset Coco Monkey. The Iron Man Stark Industries N.R.F. 425 Blaster looks real cool! My grandson would have a ball with The Playskool Musical Sit & Spin, my daughter had one when she was little and played with it all the time. I like the Aliens Nerf Nerfoop. My kids would love it! I LOVE Zambi the Baby Elephant! Furreal Friends Elephant looks cute. I like the play doh creativity center. I also like the G.I. JOE THE RISE OF COBRA Accelerator Suit Duke. I didn't know they still made the easy bake! That's a classic that every little kid should have. The sense of independence it gives you at 8 is fantastic! I like the NERF N-STRIKE Game for Wii with SWITCH SHOT EX-3 BLASTER. Anything with NERF on the box is awesome - never any worries about anything getting broken or anyone getting hurt, yet still a guarantee of fun had by all. Gotta love the NERF N-STRIKE VULCAN EBF-25 too - who doesn't want a NERF gattling gun? I know I do! The Super Soaker Aquashock Artic Blast caught my eye! This football looks so cool. The NERF N-STRIKE SWITCH SHOT EX-3 Yellow would also be sooo coool! I like the Playskool Clipo activity table. THANKS! I like the Playskool busy basics busy ball choo choo! My son would like the Nerf N-Strike Vulcan EBF. I love the Easy-Bake Oven and Snack Center!